Yield 8 Pieces - Each 3 Inch Height and 2 Inch wide. 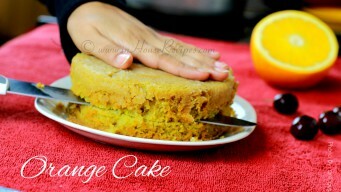 Orange Cake's name suggests two things: Either it is Orange in color or it is made with real oranges or both. We would say it is both . This delicious cake can be made without any oven or microwave-oven. 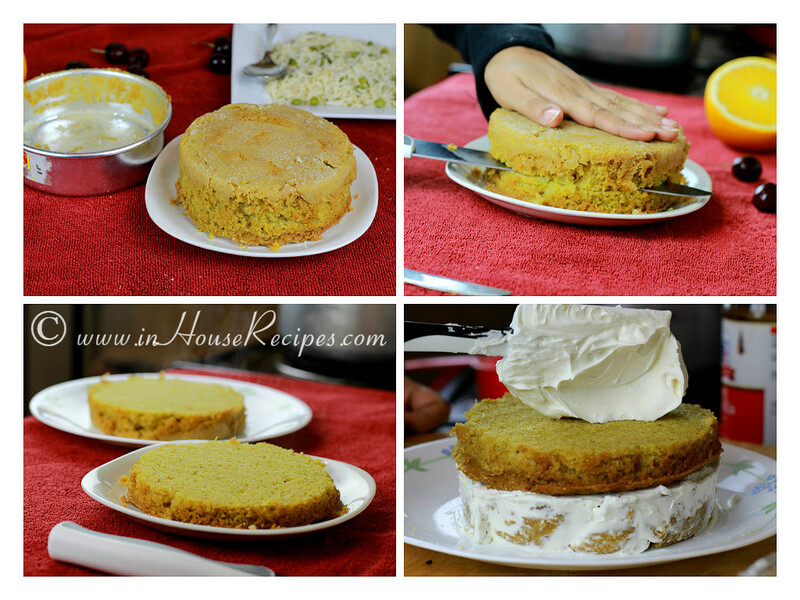 We are demonstrating how we can use pressure cooker to bake this cake at home. Also, this video only shows the dry cake part. The icing for cake is another step that you may like to do. 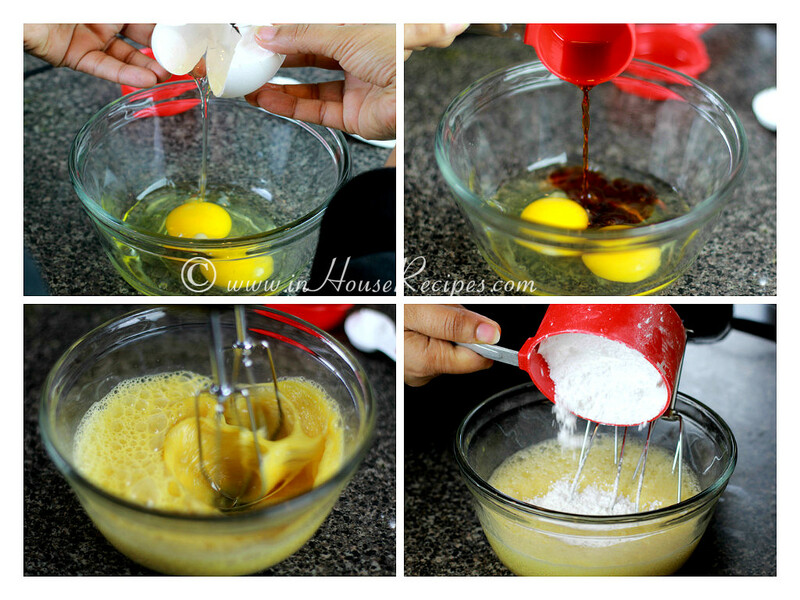 This recipe uses Egg and Baking powder to bake the cake. 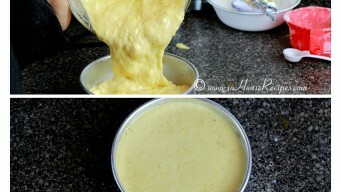 This recipe is to bake cake in cooker without Sand. Some people also suggest to use white Salt as a sand Substitute. We use neither. Instead, We like to use an Idli stand or a microwave/oven safe bowl to create a layer between cooker base and baking tray. Extract the Orange Pulp: Peel Orange’s outer hard skin as well as the whitish thin skin. You will get the real Orange pulp. If you have confusion, you can watch the video for the pulp that we are talking about. Keep it aside. Break open both Eggs in a big bowl. 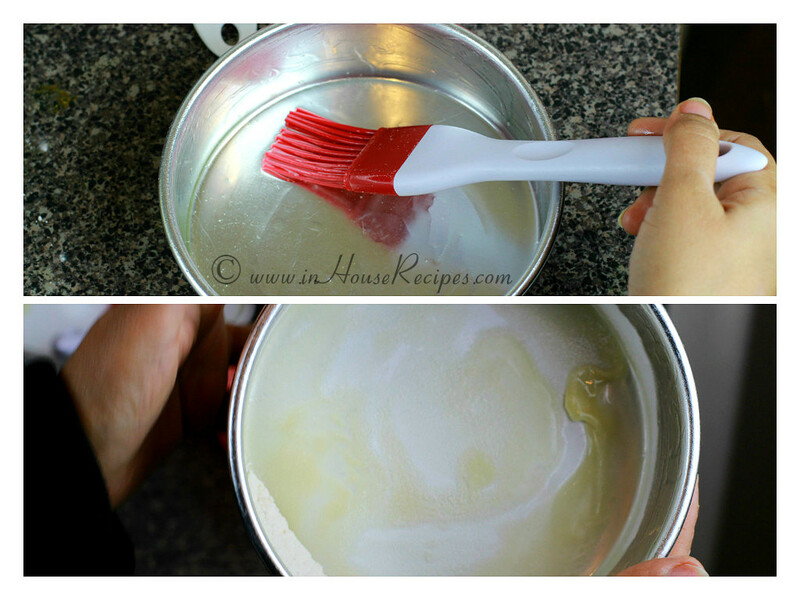 Add 1 Tsp of Vanilla Essence and mix well once. Then add Sugar. 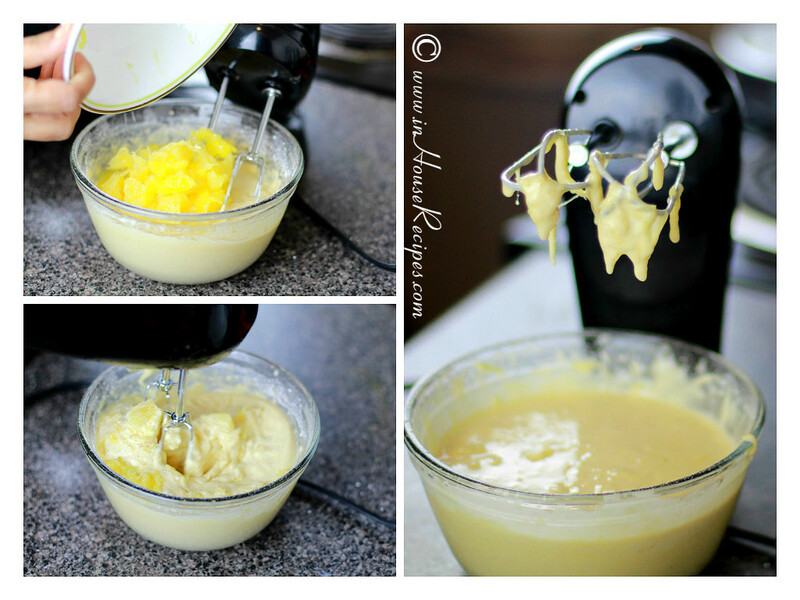 Use a hand mixer/beater to mix. 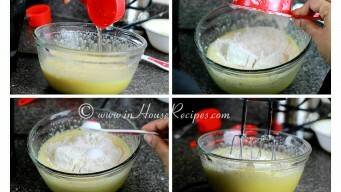 Add Oil, All Purpose Flour and Baking Powder. Mix it once again. 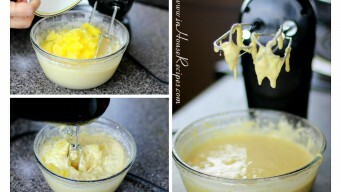 Add Orange pulp and mix it for about 1 minute to make it a smooth paste. Make sure that it does not have any visible lumps. 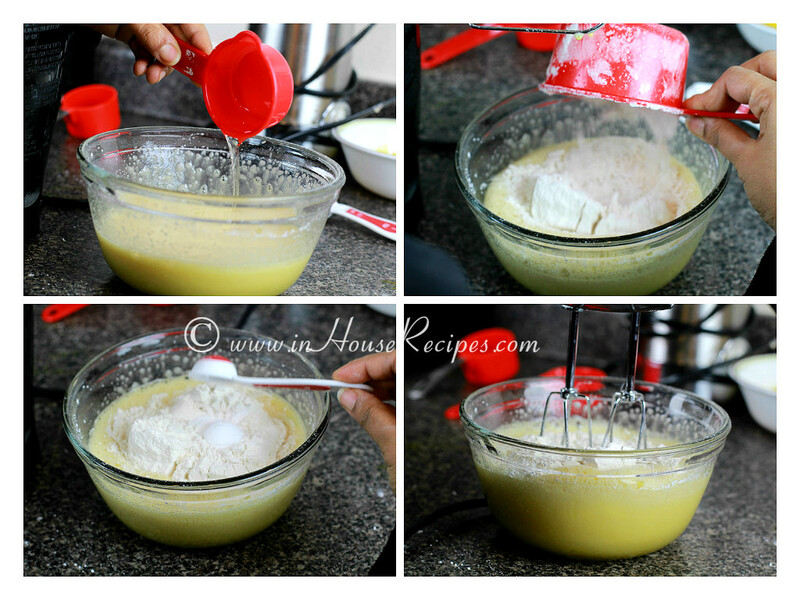 Cake paste/batter is ready. Now we will do the preparations for baking it. We are using an Aluminium round shaped tin to bake our cake. It is advisable that you use an aluminium tin as it goes well with baking in Cooker. Do NOT use STEEL tray for baking. It is going to burn your cake. 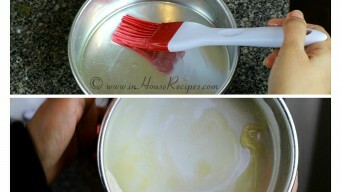 Grease the tin with cooking Oil on all sides internally. This will help to make its surface non-sticky for the orange cake. Now add 1/2 or 1 tsp of All-pupose-flour Maida and roll over the tin to spread it all over the surface. This will help you find the grey areas on surface which have not been greased with Oil. Grease them if you find any such areas. Our baking tin is ready. 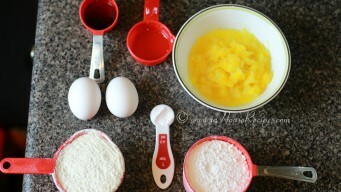 Add the Orange Cake mixture. Now take a pressure cooker which is big enough to hold the tin. 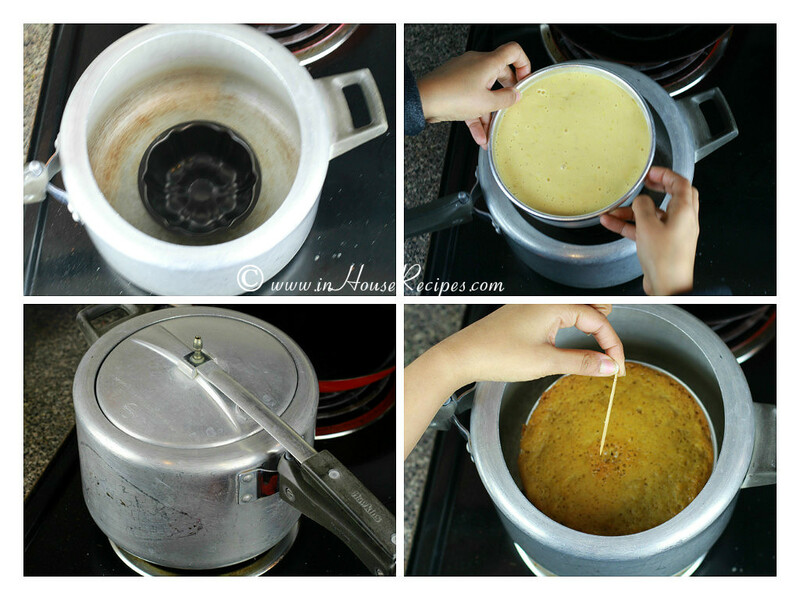 Use an Idli stand and place it between cooker base and cake tin. This is done to avoid the direct heat to tin and avoid cake’s burning. You can also use a bowl if you do not have Idli stand. Do not use a Steel bowl or plate. Neither for baking nor for keeping it between cooker base and baking tray. Cover the cooker with the lid. Place the flame/stove on high. Do not put the whistle on the lid. After 2 minutes, turn the stove on low flame for about 25 minute. After 25 minutes, switch Off the stove. Now open the lid and check whether cake has baked completely or not. Poke a tooth pick at the center of the cake. If it comes out clean (No sticky material on it, it is ready. Otherwise bake it again for 5-7 minutes on low flame. 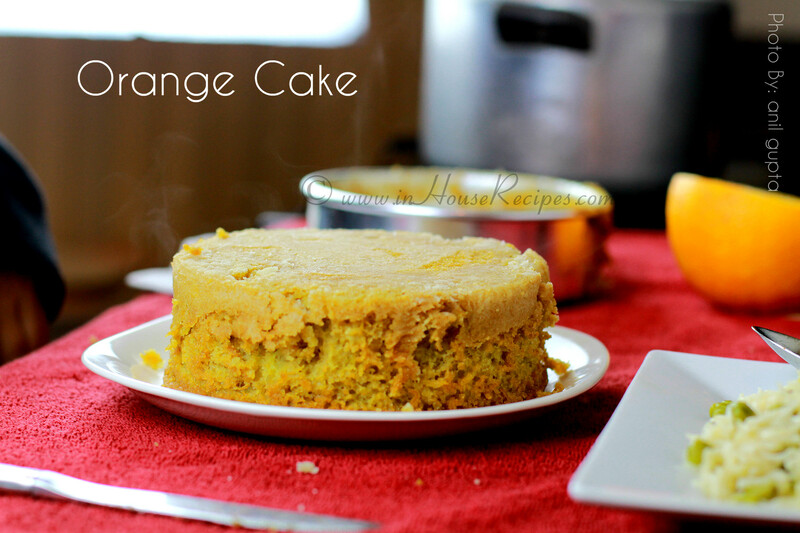 Our orange cake has baked fine as the tooth stick was clean.Cover the lid back and keep aside the cooker for 10 minute to cool down. After 10 minute, take out the tin from cooker. Separate the cake from tin corner with the help of a knife. Once done, keep the tin up side down. 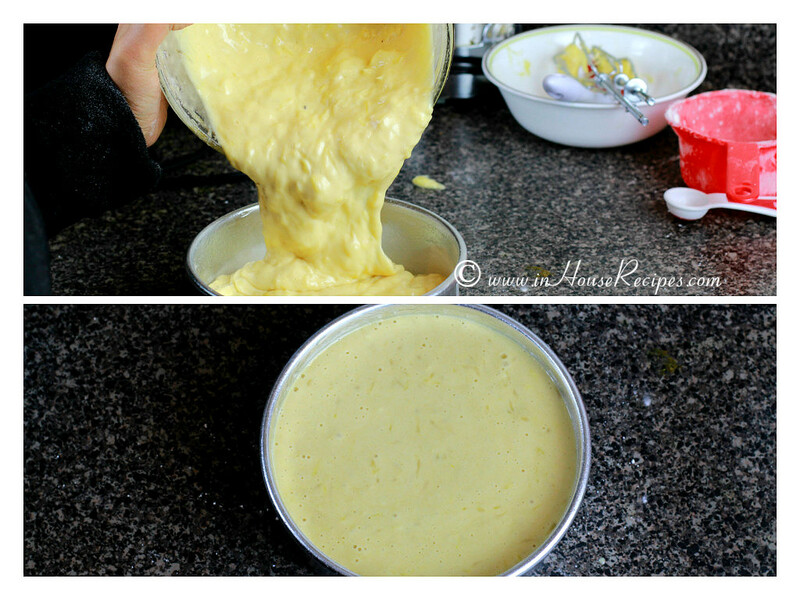 Tap the back of the tin, so that cake will be separated completely from the base. 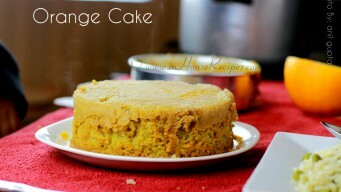 This is dry Orange Cake and is ready to serve. It is moist, fluffy and ready to be laced with whipped cream and decoration. You can serve it right away or do the icing of your choice. Cake needs refrigeration if you want to store it for more than 1 day. It can be stored and used for up-to 5-6 days if kept in refrigerator. 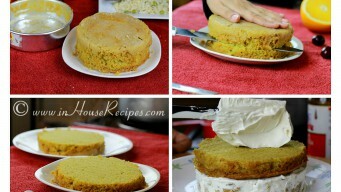 Do remember that the cake starts losing its softness and moisture once it is refrigerated. Hence, it is best to consume it fresh. 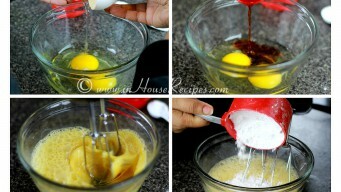 You can garnish the cake with chocolate sauce or decorate it with whipped cream before serving. 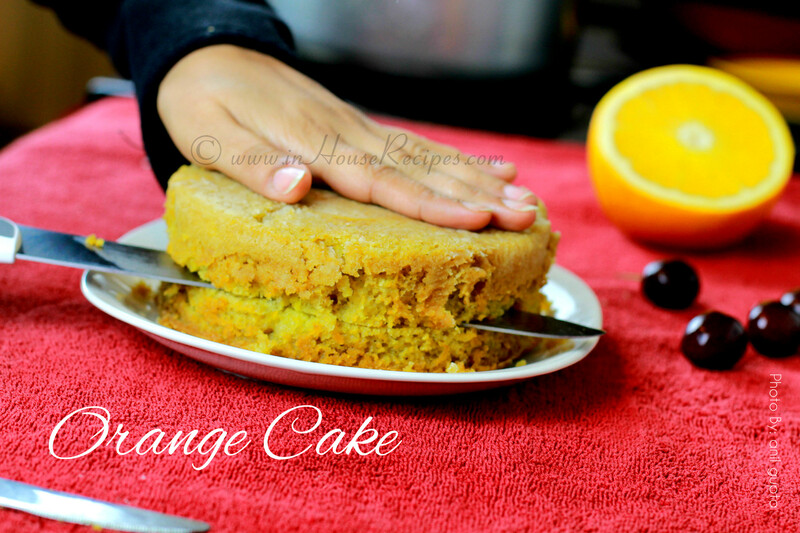 Orange cake is just one example of baking cake in a cooker. 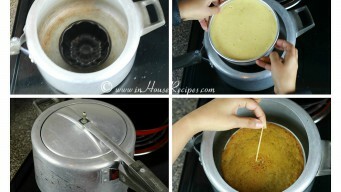 We can even bake a molten lava cake in cooker.